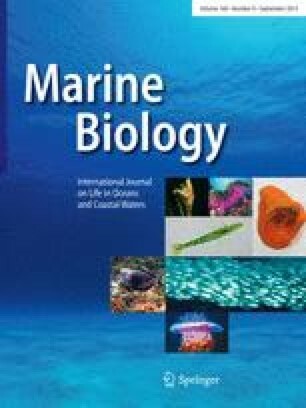 The combined effects of temperature, salinity and nutrition on survival and growth of larvae of the Mediterranean mussel Mytilus galloprovincialis and the Japanese oyster Crassostrea gigas were studied over a period of 7 d in the laboratory. Ripe adults, collected in spring and summer 1987 from natural populations in the Bay of Arcachon, France, were induced to spawn. Larvae of both species were cultured at four temperatures (15°, 20°, 25° and 30°C), four salinities (20, 25, 30 and 35‰S) per temperature, and two levels of nutrition (fed and unfed) per temperature/salinity combination. The fed larvae received a mixed algal diet of 50 cells each of Isochrysis galbana and Chaetoceros calcitrans forma pumilum per microlitre. In both bivalve species, larvae survived over a wide range of temperature and salinity, with the exception of mussel larvae, which died at 30°C. Statistical analysis indicated that nutrition had the greatest effect on larval development, explaining 64 to 75% of the variance in growth of M. galloprovincialis and 54 to 70% in growth of Crassostrea gigas. Unfed mussel larvae displayed little growth. Compared with temperature, the effect of salinity was very slight. M. galloprovincialis larvae exhibited best growth at 20°C and 35‰S and C. gigas at 30°C and 30‰S.